What a pure, beautiful voice Anne Walsh has! I was making a lullaby compilation CD and listening to 30-second snippets of music online. There is so much kitschy, badly-sung kids' music out there (Okay, I am picky about diction and scooping notes because I am a singer myself, so I had to listen to a LOT of music to find something I liked.) 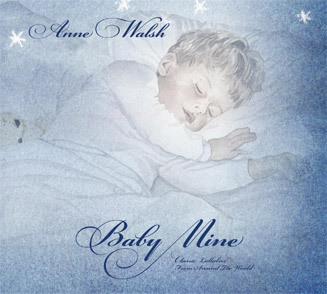 When I heard Anne Walsh's "Baby Mine" and "All Through the Night," it was like a breath of fresh air. Her renditions of these classic lullabies are soothing, classy and all-around well-done. The best word to describe her voice is "pure." She doesn't need to add any schmaltz to make it sound good. I hope Ms. Walsh will make more CDs soon!